Had a good time with the guys at Sportech this morning. They've been meeting for study for almost a decade now, working either through a book of the Bible or another book that helps them apply the Bible to their lives. It was a privilege to drink coffee, talk, and pray with them today. 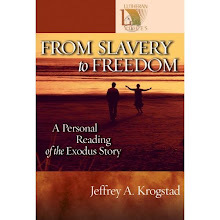 This morning we read a chapter out of From Slavery to Freedom and discussed it. I was struck by two things this morning as we talked. First, the chapter we read focuses on Pharaoh's power and his desire to be in control. I was impressed again by how God does not use the strong, the powerful, the movers and shakers to accomplish his purposes. He takes the weak -- the Israelite slaves, for example, or Moses, the convicted murderer and fugitive -- to do his work. God does not want us for our strength, but so that he might demonstrate his power in our weakness (see 2 Corinthians 12:9). When we realize that all the glory, all the honor, all the control belongs to God, then we realize that what we thought was strength is really only a gift we can offer back to God for his purposes. Second, as we read aloud Exodus 5 and the first part of Exodus 6, I was struck (especially in this group of guys) by how our work can become such a tool that our enemy uses to oppress us. The Israelites were oppressed by their work. Pharaoh used brick-making as a tool to keep them under his thumb. I talk so often to guys who are bound up in their work -- in the need to be productive, in the need to prove themselves, in the need to demonstrate their competence and ability. But Satan uses work (which is supposed to be a gracious, life-giving gift from God) to enslave us. I jumped the tracks this morning and went back into Genesis, to the story of Cain and Abel. Did you know that "Cain" means "productive"? (See Genesis 4). And though the Bible doesn't point it out, "Abel" is the Hebrew word for "empty." Adds a different dimension to the question of why God accepted Abel's offering and not Cain's, doesn't it? Brings us back to the question of strength vs. weakness and what God really wants from us. God doesn't want your ability, your productivity, your busy-ness, your quotas. He wants your brokenness, your weakness, your inadequacy, your emptiness.